I didn’t even know they were an item. Did you? But I found a bunch of pictures of them together, so I guess they are. 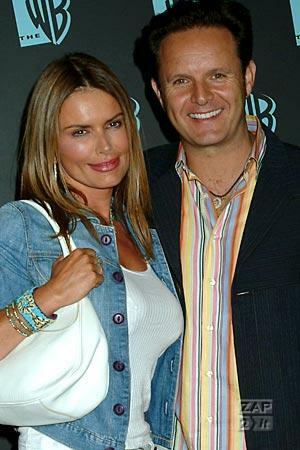 Over the Thanksgiving weekend, Survivor producer Mark Burnett and Touched By An Angel’s Roma Downey, both 46, got engaged. Apparently, they don’t feel the same way as Cameron Diaz when it comes to marriage. “I have found my angel,” Burnett told People magazine. The new Burnett/Downey family will be a blended one, with Roma Downey’s 10-year-old daughter from her second marriage, Reilly (this will be Roma’s third marriage), and Mark Burnett’s two sons from his first marriage (this is his second), 13-year-old James and 9-year-old Cameron. All the kids were there when Mark got down on one knee. Of course I wish them all the happiness that a marriage should bring, but in Hollywood, having a successful marriage is probably harder than pulling a big rig with your pinky finger, so I hope they’re ready for the hard work that lays ahead. 48 queries in 0.624 seconds.